Home » » Blog » Life on the Road! 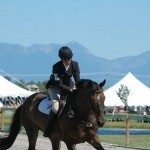 Training sessions for Developing Riders were the following week so there was no down time. 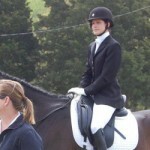 I had two dressage lessons with Kim leading up to lessons with Mark Philips. The difference in how I was riding in just a short period of time with her help was huge. Mark was very pleased with our progress. We worked on flying changes and for once I could properly ride corners!!! I wish I could have had more lessons with Mark as he is incredibly helpful with Max (Young Gun). Since then, I have been lessoning a ton with Kim. The focus has been on trying to master the art of not pulling 🙂 She likes the horses in an uphill balance with a very light contact and never behind the vertical. This can sometimes feel like rocket science to me! I am starting to get a more consistent grasp of it and all the horses are going well. 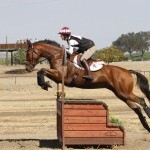 As for the jumping, she wants the horses to go on a light contact and really challenges me to better read the lines. I am learning to ride forward in and softly to allow for support on the out. Overall, I am very happy with our progress and can’t wait for more lessons. Since Max and I haven’t run anything since the CCI** at Galway in the fall I chose to start out at Fair Hill this past weekend in the OP. Max was very frisky but got the job done rather well. We Won!!! Now, back to lessons and getting ready for the next event MCTA in a couple weeks. 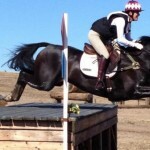 I will try to keep this Blog thing updated to fill you all in on Next Phase Eventing adventures! One Response to Life on the Road! You sound like you are having a great time…all your hard work is paying off. I am having a blast with Dubs,camp will be a laugh!